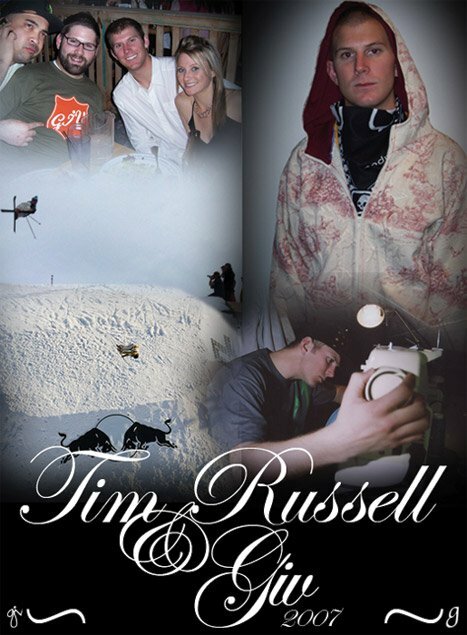 GIV would like to announce the latest addition to their family – International Skier Tim Russell. With a career that has seen Tim winning the Gravity Games Rail Jam, the Orage Masters, and regular stand out film parts, Tim has become known as a hard working activist for freeskiing.Everyone at Giv is very excited to have someone with Tim’s vision and dedication to product development be part of the creative process. Working with our design team, Tim jumped right in and began to work on a collection of pieces that were suited to his traveling lifestyle. Preparing for release in fall of 2007, the Traveler Collection contains a few of the necessities of a world wide winter athlete. A comfortable t-shirt, a warm hoodie with technical details, and a sharp button down shirt to go out in, the Traveler Collection has you covered in any situation.This year Tim Russell will be filming parts for Poor Boyz Productions and Rage Films. Along with GIV Tim also represents Volkl, Marker, Technica, Scott USA, Bern Helmets, and Level Gloves. Tim is spending his winters in a car, plane, and on a snowmobile …sometimes he sleeps in Salt Lake City , UT. GIV is a technical, functional, lifestyle brand found only in specialty retail locations. For more information or a catalog please email info@givbrand.com or visit http://www.givbrand.com where you can find our daily updated family blog.